Although the Blazers vs. Mavericks game became an instant classic, guard Evan Turner broke his third metacarpal on his shooting hand. The injury occurred in the third quarter as he tried to break through a Harrison Barnes screen. Turner immediately grabbed his hand after the collision and was subbed out of the game the next dead ball. He was taken back into the locker room and received x-rays to confirm the break in his hand. Doctors don’t believe that he’ll need surgury, but according to Mike Richman, Turner repeated to reporters “I’ll be fine. I’ll be fine,” over and over again. NBC Sports reports that the average recovery time from this sort of injury is 6-8 weeks. The injury is a major blow the Blazers. Not only has Turner gotten used to the Blazers’ offense, but his insertion into the starting lineup have made the Blazers better as of late. Although his perimeter shooting has been off, his playmaking and inside scoring have given the Blazers new life. Turner’s absence will likely see Al-Farouq Aminu back into the lineup. Look for Pat Connaughton and/or Shabazz Napier to earn some extra minutes off the bench for the next few weeks. Who ever enters the lineup, the Blazers need to keep up their improved play if they want a shot at making the playoffs. 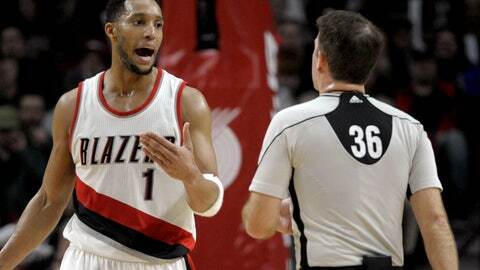 The loss is big, yet Portland can’t lose a step. Next man up Rip City, we’re going to need it.